Maybe I've been living under a crafting rock, but did you know that freezer paper is sort of like, an amazing trick of the crafting trade? Yes, freezer paper. The kind you can buy in the grocery store paper aisle next to it's BFF aluminum foil. Or you can buy it here. For those of us who don't have a fancy cutting machine, freezer paper is the perfect stencil. Let me explain. For Christmas, I wanted to make David's aunt (who we call "Nornie") a special gift. HDawg looooves going to his Nornie's house (she really does have an amazing home!) and asks at least every other day to do so. 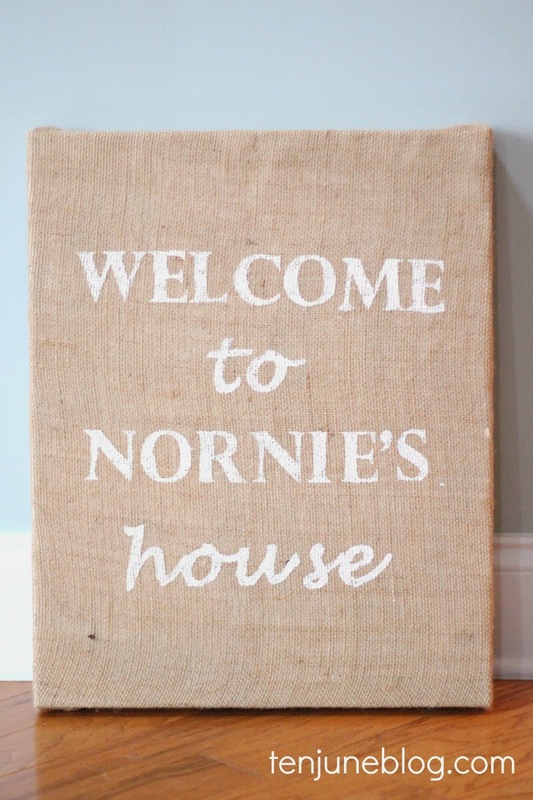 So I wanted to whip up a sign that showed our love for both Nornie and her house. Here's my favorite part about the freezer paper- you can iron it on temporarily to whatever you are painting so that it stays still while you paint the stenciled letters. Boom. Crafty mind blown. I was apprehensive that the paper would iron on to the burlap, but it held tight perfectly. Iron the shiny side facing down towards the fabric. I used off-white craft paint to paint the stenciled letters and then simply peeled up the freezer paper (no residue! easy to peel off! a crafting miracle!) before the paint dried. My letters were crisp and perfecto. Okay, and the top line is a little crooked, but who's counting. Not Nornie! Now all of you can say- duh, Michelle! 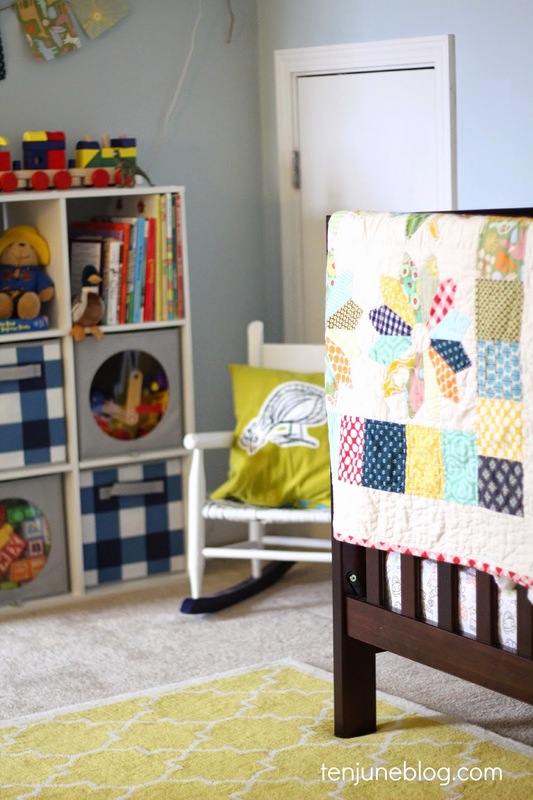 We've been crafting with freezer paper since 1999! 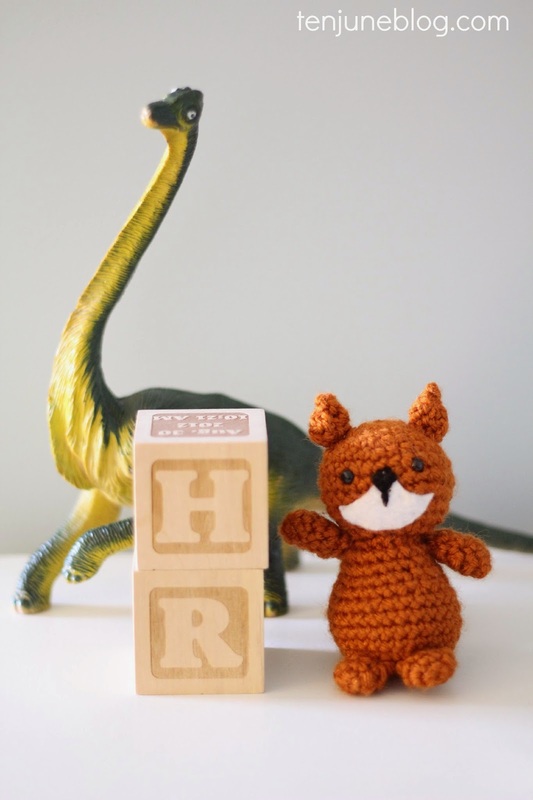 Welcome to the crafting world! Or you can be a novice like me and search on Pinterest for all of the other amazing projects you can do with freezer paper. 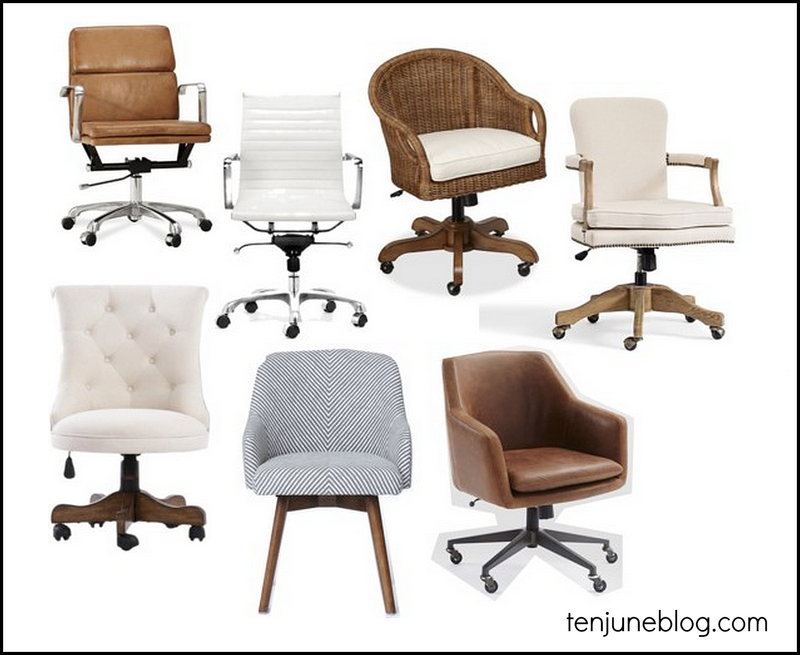 Office Chair Round Up: Comfortable But Cute? One of the major perks of working mostly from home is that I get to design my own office! Right now, I've got our big ol' amazing desk (you can see it here, the previous owners of our old home simply left behind! craziness!) and this DIY bamboo chair as my set up. But the chair just isn't cutting it for the amount of hours I spend in it. I need something more comfortable and ergonomic. I would love to hear if you have any suggestions about brands or pieces. Whose got an awesome desk chair that you'd love to share?! Like most of you, the "new year = organized house" bug has taken over at our place. My kids must have been pretty good this year because Santa and family spoiled them silly. 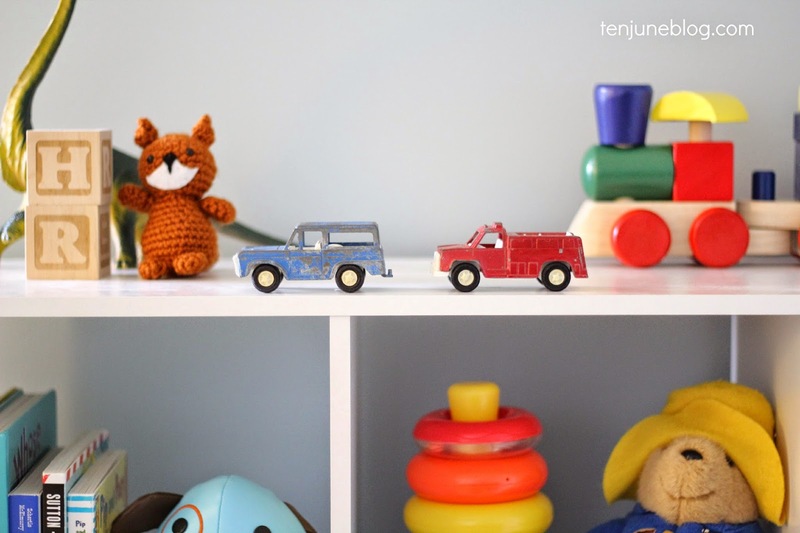 With all of the new toys in the house, I was anxious to purge the old and organize the new. A few weekends ago, we spent a few hours going through things and ended up donating some of their old, gently used toys to Goodwill. I picked up some new bins to make the rest of the toys look pretty and neat. These photos are from HDawg's room, which is a large bonus room space so we've sort of turned it into the bedroom/playroom. 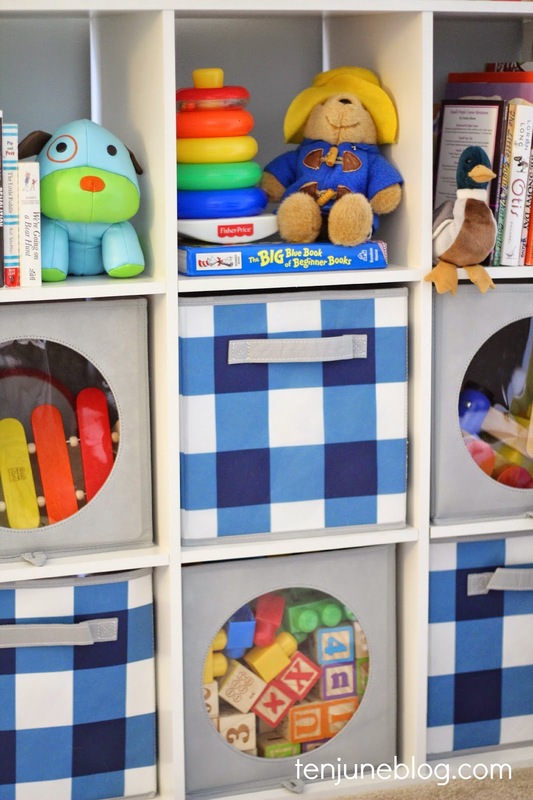 Our downstairs toy storage system is a whole different story... let's just say we're still working on getting that area organized. 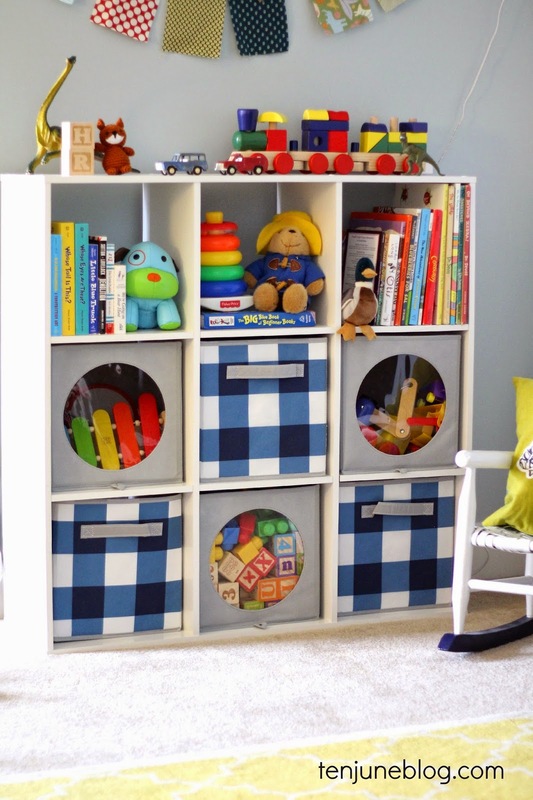 You can find these storage bins right here and here (on sale!). Also, I used my fancy new camera lens for these photos. I've still got a lot to learn (and it was rainy and dark when I took these photos), but eventually I'd like to do a post on the basics of the lens. "Photography for this dummy" for sure! Hey, hey. Welcome to the first post of 2015, friends. I'm excited to start a new series today entitled "The Dream House." I don't get to do a lot of major decorating around our rental house these days but hopefully at some point in the near future, we'll have a new house of our own to decorate like crazy. Until then, I decided to lay out all of the ideas swirling around my head in a series of dream plans. Basically, if I was able to design my dream house now, this is how I would do it, room by room. Thus, The Dream House series is born. On my brain today? The kitchen. 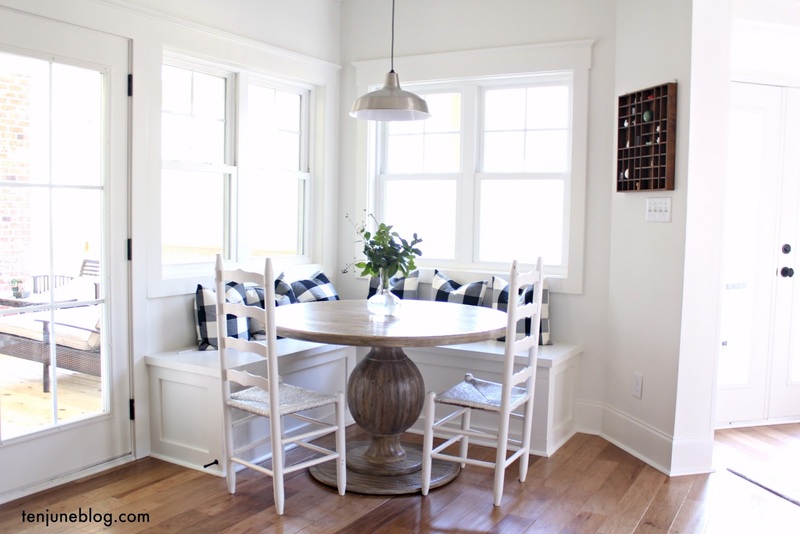 True to my roots, I am thinking about a traditional white kitchen with some fabulous contrasting black accents. My dream kitchen also needs some kicked-up pattern and color in the form of rugs and art, as well as some natural texture with hardwood floors and some wooden open shelving. What do you think? 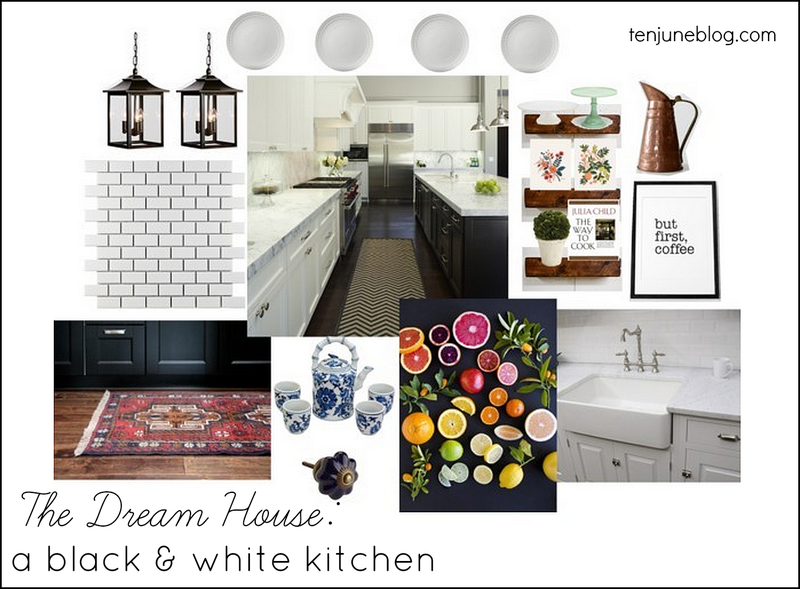 Are you digging my traditional black and white kitchen scheme?